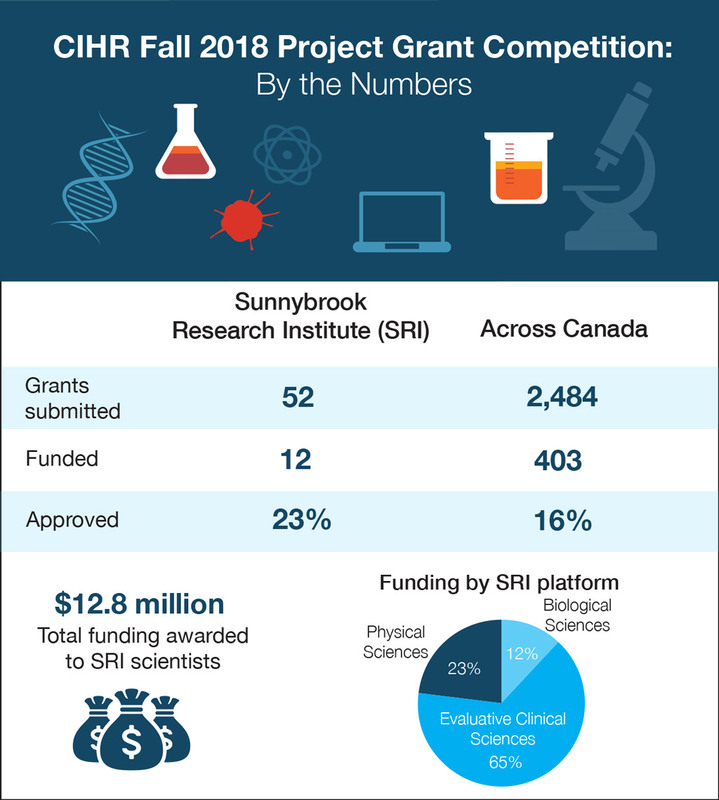 The painstaking efforts involved in grant writing paid dividends for 12 scientists at Sunnybrook Research Institute (SRI) whose applications were approved by the Canadian Institutes of Health Research (CIHR) in the Fall 2018 Project Grant competition. Collectively, they pulled in an investment of $12.8 million by the national funding agency. At 23%, SRI’s success rate exceeded the national average success rate of 16%. “Securing research dollars is tougher than it’s ever been, yet our scientists continue to excel. These results speak to the quality of the research and the dedication of our faculty,” says Dr. Michael Julius, vice-president of research at SRI and Sunnybrook. A proposal by Dr. Simon Graham, a senior scientist in Physical Sciences, was especially well received. It ranked first among 57 applications by the committee of experts that reviewed it. He will receive $841,500 over five years to investigate a promising MRI method to use on people who have had electrodes implanted in their brain as part of their deep brain stimulation (DBS) therapy. In DBS, electrodes are implanted in the brain and activated by a device inserted in the chest. Magnetic resonance imaging, the gold standard for studying diseases of the brain and spinal cord because it can show these tissues clearly, is seldom used on these patients because heating during the scan can cause brain damage. Graham and SRI scientists and neurosurgeons Drs. Clement Hamani and Nir Lipsman will study a new MRI technique that can suppress these heating effects. The goal is to develop the technique so that MRI can be used safely to monitor people treated with DBS. The researchers also aim to develop this MRI method as a research tool to uncover the mechanisms by which DBS works. Dr. Stephen Fremes, a scientist in the Schulich Heart Research Program, received the largest grant. He and co-principal investigator Dr. Mario Gaudino of Weill Cornell Medicine in New York City were awarded $5,339,538 over seven years to lead an international, multicentre randomized controlled trial comparing two methods of coronary artery bypass surgery, an operation to improve blood flow of the heart. Fremes, who is also a cardiac surgeon at Sunnybrook, says he feels “very fortunate.” In a study of 4,300 people undergoing the procedure, he and his and colleagues will analyze whether using bypass grafts from arteries in the chest wall or arm is better than using leg veins for most of the bypasses, which is the clinical standard. Dr. Carol Schuurmans, a senior scientist in Biological Sciences and the Dixon Family Chair in Ophthalmology, was awarded $1,101,600 over five years to study how proneural genes, which promote the creation of neurons, control whether neural stem cells remain inactive, divide or evolve into neurons. One aim is to manipulate these genes to induce neural stem cells to produce new neurons in development and after brain injury. “Understanding how embryonic neural stem cells are controlled is essential because they give rise to adult neural stem cells, but they have an enhanced capacity to give rise to new neurons. If we can understand how they are able to generate new neurons, we will be better placed to understand why adult neural stem cells differ and are less able to make new neurons to repair brain injury,” says Schuurmans. Dr. Greg Czarnota, director of the Odette Cancer Research Program and senior scientist in Physical Sciences, was awarded $598,995 over three years. He and co-principal investigator Dr. Michael Kolios at Ryerson University will advance their research into whether quantitative ultrasound can be used to predict the response to chemotherapy of women with breast cancer before the start of treatment. This technique uses the raw data produced by ultrasound machines to glean insights into cancerous tissue, like whether tumour cells have died right after treatment. Dr. Benjamin Goldstein, a senior scientist in the Hurvitz Brain Sciences Research Program, will receive $952,425 over five years to look at whether bipolar disorder is caused by diseased small blood vessels throughout the body. Dr. Julie Hallet, an associate scientist in the Odette Cancer Research Program, was awarded $248,626 over three years for her research into neuroendocrine tumours. Specifically she will evaluate patient-reported outcomes, patterns of symptom severity, survival and health care costs. Dr. Sander Hitzig, a scientist in the St. John’s Rehab Research Program, will receive $149,176 over two years to develop a patient-reported outcome tool that reflects the impact of lower-limb amputation on quality of life. The aim is to provide clinically meaningful data that will help guide assessment and treatment of patients. Dr. David Juurlink, a scientist in Evaluative Clinical Sciences, was awarded $120,000 over two years to study the safety of prescription opioids. Dr. Stanley Liu, a scientist in the Odette Cancer Research Program, and co-principal investigator Dr. Thomas Kislinger from the University of Toronto, will receive $459,000 over three years. They aim to identify noninvasive urinary biomarkers—measurable substances in the body, like proteins, that can indicate if tissue is healthy or diseased—that can guide prostate cancer management. Dr. Anne Martel, a senior scientist in Physical Sciences, and co-principal investigator Dr. Lincoln Stein of the Ontario Institute for Cancer Research, were awarded $780,300 over five years. Their goal is to develop a tool that uses images of tumour tissue to “train” computers to identify high- and low-risk cancers so that treatment can be tailored to the individual. Dr. Meaghan O’Reilly, a scientist in Physical Sciences, will receive $673,200 over five years to study the use of focused ultrasound to deliver drugs to the spinal cord to treat tumours and other conditions. Dr. Jill Tinmouth, a scientist in the Odette Cancer Research Program, was awarded $1,510,875 over five years. She is working with a large team of cancer investigators including Alethea Kewayosh, director of Aboriginal Cancer Control for Cancer Care Ontario, to improve Indigenous cultural safety in Ontario’s cancer screening programs. $12.8 million total funding awarded to SRI scientists. Twelve scientists at Sunnybrook Research Institute (SRI) were awarded Project Grants from the Canadian Institutes of Health Research in the Fall 2018 competition. In total, they were awarded $12.8 million by the national funding agency. At 23%, SRI’s success rate was above the national average success rate of 16%.